Keep a supply of trade items handy for all your geocaching friends out there! When you find a cache and you take something out, you want to leave something, right? Now you can add a selection of trade items to your order. They come individually sealed in ziplock bags, so you can keep a few in your backpack when you go geocaching. 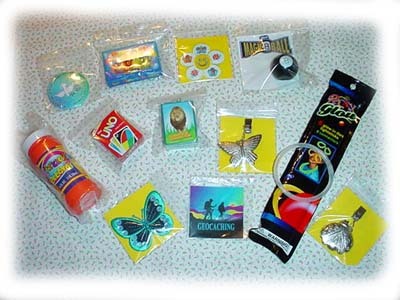 The photo above shows a sample of the trade items: iron on patch, bubblestuff, metal clip-on bumblebee, geocaching button, card games, geocaching magnet, lightsticks, modeling clay, mini magic 8 ball... Note: you may receive different items from those pictured because we're always on the lookout for new and unusual selections - but we guarantee they'll be great trade items!